Mini Pom-Pom Pets Only $17.08! You are here: Home / Great Deals / Amazon Deals / Mini Pom-Pom Pets Only $17.08! Summer is going to be here before you know it and the kids will be home All The Time! Make sure you have some fun outdoor and indoor activities to keep them busy! 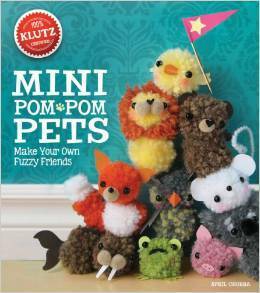 Get the Mini Pom-Pom Pets – Make Your Own Fuzzy Friends Craft Kit for Only $17.08! How can you make a mini-menagerie of soft, fluffy little pets? It’s as easy as twirling a dinner fork. Follow step-by-step, illustrated instructions and color-coded charts as you wrap, tie, and snip the colorful yarn into petite pom-poms. This craft kit contains enough yarn for more than 20 teeny pets!